Nothing is easier and more fun than painting stones. You don’t have to be good at it. You can be very, very bad at it, in fact, and still enjoy the process and produce a work of art. What’s the definition of a work of art? Mine is: anything that touches you. It doesn’t matter if no one else likes it. I’ve had this North Carolina river rock (that I bought at a garden center in Hickory NC, where I used to live…you really shouldn’t take rocks from creek or river beds!) for over twenty years. 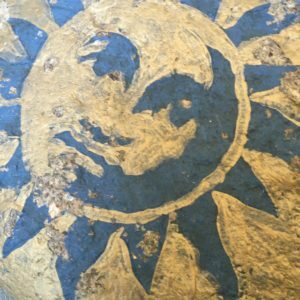 I painted it and stenciled it with a sun image and sprayed it with Modpodge. It’s been sitting on my front porch, along with a stenciled rock with the moon on it, all this time, and I never tire of seeing them. They remind me of days gone by, precious days when my kids were small. 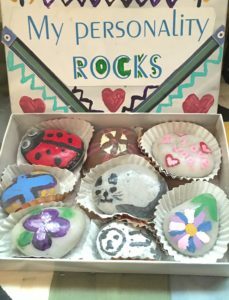 I also treasure a little box of rocks my daughter made at one of her birthday parties in middle school. The cover of the box says, “My Personality Rocks.” Get it? Your personality rocks, yo! Inside, in little candy paper wrappers that I bought at the arts-and-crafts store (along with the boxes), my daughter painted little rocks with different images that reflect what she loves about her life, herself, her world. If I had to choose between saving a ring with a rock on it–a diamond, an emerald, you name it–and this box of painted rocks, I’d save this box that captures my daughter at a certain age. So go out and get some rocks and paint! Allow yourself to sit down and create something humble but your own, something that speaks to you….